Summary: The aftermath of tropical storms creates a critical need for local MTP holders to pinpoint turtle nests on a highly developed coastline. Many nests wash out in storms but some which were previously marked merely lose their marking stakes. Re-establishing the locations of nests is critical in order to avoid unintended damage to nests from post-storm activities such as those outlined in the following sentences. FWC expects to have nests monitored for the INBS and SNBS programs. Sarasota County must move lifeguard stands back to pre-storm positions for public safety. Beach cleaners need to remove seaweed accumulations. Emergency beach or dune restorations and debris removal are often needed. Tourism resumes with beach related events and placement of beach furniture. Storm erosion narrows the remaining dry beach so that daytime recreation concentrates in the same upper beach that turtles use for nesting. All of this puts nests at risk if they cannot be found to be re-marked quickly. The need for rapid response requires the use of accuracy in finding and re-marking nests. This project will purchase survey quality GPS unit (measuring to a few inches) that will determine nest locations, even if marker stakes go missing. The equipment would safeguard 35 miles of important Gulf of Mexico loggerhead beaches against catastrophic loss of nest location data needed for effective monitoring. Results: The GPS was tested in the field on high priority zones where Mote provided nest monitoring in accordance with the FDEP beach cleaning permit held by Sarasota County. In this area, nest posting was not necessary until the event of a storm at which time nests would be posted such that Sarasota County could conduct beach cleaning. 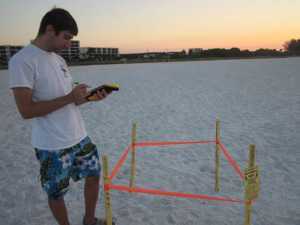 The sub-meter GPS was utilized for the accurate determination of six nest locations on Siesta Key. Nests marked with stakes were triangulated with three backup stakes placed at known distances in the dunes seaward of the nest. Three staff and three interns were trained to use the sub-meter GPS in the field. Terrasync Pro software was installed on one computer. Unlike 2012, when Tropical Storm Debby and Isaac caused a loss of 1022 nests, the 2013 season saw no major storms for the Sarasota coastline and only documented the loss of 39 nests. The sub-meter GPS was only necessary for the accurate re-location of a single nest. However, based on its performance, we are looking forward to using it in the future and are encouraged that the Trimble GPS will enable rapid responses to relocate nests after future storm events. - The Trimble fulfills both the required latitude/longitude location for FWC documentation as well as optional backup procedure otherwise fulfilled in two steps: GPS and triangulation. - The Trimble took only 3-5 minutes to get an accurate location in comparison to 5-10 minutes to place triangulation stakes. - The Trimble provided more precise locations in a similar amount of time compared to the other less accurate handheld GPS units. Locations are usually taken using a Garmin eTrex Venture HC or Geko models 101 and 201 which took 1 minute and 4 minutes (respectively) to reach an acceptable location accuracy of less than or equal to 15 feet. However, the Trimble reached a location accuracy of 19-22 inches (48-56 cm) in less than 5 minutes. Once on, the Trimble took virtually no time to get new location readings. - Using other GPS units, an acceptable accuracy of less than or equal to 15 feet was not always met. In 2013, 255 locations had accuracies > 15 feet, while the Trimble provided < 3 feet at all times. - The Trimble requires only one person to operate and no other equipment, while triangulation required three stakes, marker, measuring tape and mallet, and is not simple for one person to complete alone. - The Trimble provided a simpler backup method in areas where a nest was laid on a wide beach. For triangulation on beaches wider than 100 feet, 3 foot triangulation stakes secured with flagging tape were placed in the middle of the beach (Figure 4), as shorter stakes introduced a tripping hazard on a dark beach and any stakes left without flagging tape were often removed or vandalized. - When we were unable to re-find a nest after a storm event, we were more confident in calling a nest a washout using the Trimble because wind, measuring tape taughtness and barriers often decreased the accuracy of the triangulation method. - In situations where high tides washed out nests and nests needed to be re-staked without verification of eggs, the accuracy of the Trimble allowed for nests to be reposted with a 1.5- foot radius around the nest site while triangulated nests were reposted with a minimum 5-foot radius.